As part of Sandwich Bay’s legendary triad of Open Championship hosts, together with Royal St George’s and Royal Cinque Ports, Prince’s Golf Club is a classic seaside layout that remains at the heart of British golfing history. Prince’s remains somewhat of a hidden gem but it is undoubtedly one of England’s finest courses, the newly refurbished Himalaya's 9 and short game area complete the golfing experience. Found in Sandwich, nestled among the striking sand dunes of Kent’s east coast, Prince's is an excellent option for UK golfers looking to play some true championship golf. The Lodge at Prince's Golf Club provides top-quality accommodation for those staying nearby and is the hotel of choice for golfers taking on all three of the Open hosts at Sandwich Bay. Henry Cotton and Gene Sarazen are not only among the game’s greatest names, but are also at the head of the lengthy line of Prince’s admirers; among the accolades these golfing legends bestowed were “the greatest links course” and “Britain’s finest course”. The layout itself is a classic seaside course in character, reflecting the inherent features of the local terrain. The humps, bumps and hollows created by the Kent coastline’s myriad of sand dunes are heaven-sent for golf, and course architect Charles Hutchings (1902 Amateur Champion) took full advantage. Prince’s, like its visiting golfers, is always at the mercy of the elements, and the character of the golf course can alter dramatically with the wind. 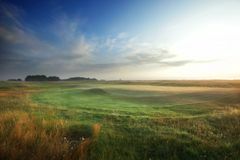 Rugged and unpretentious, Prince’s is pure links golf, and is without doubt one of the country’s brightest gems. The Shore course is the longest of the three 9 hole loops and as the name suggests, it follows along the shoreline south towards the lodge which is located at the entrance of the course. The Dunes course is an anticlockwise loop with 5 holes heading towards boundary of Royal St. George's and 4 holes heading the opposite direction back towards the start of the course where the original clubhouse was built. The Himalayas course is the shortest of the three courses as it only has one par 5 and is known as the members favorite course. Practice facilities include a driving range, chipping and putting greens. As of July 2011, coinciding with the Open Championship at neighbouring St George's, Princes Golf Club is available for fully fledged stay and play golf packages. The construction of the dormy house style Lodge at Prince's Golf Club means that high quality accommodation can be added to the outstanding course for golf break visitors. The Lodge at Prince's is located adjacent to the club's main entrance, overlooking the 13th green at Royal St George's, and transforms Prince's into the focus for golf breaks in Kent. Golfers have the option to enjoy the 27 superb holes onsite at Prince's or savour some of the Garden of England's other top class courses like St George's and Royal Cinque Ports. We were upgraded from a normal room to a suite overlooking the 5th green! We had told them in advance we would be taking our dog. They had very kindly left a dog bed, blanket, bowl, ball and treats in the room for her. The room was very stylish, comfortable and roomy. Great accommodation at the Lodges. Very comfortable, clean, spacious & modern with all the usual amenities. Vey good restaurant & bar at reasonable prices. I would recommend them to anybody wanting to stay at Princes G.C. Three different 9’s. we played 18 on day one, 36 day 2 and 18 on day 3. If you like links courses then this is the place to play. The re-vamped Himalayas 9 was probably the most interesting and challenging and the Shore probably the easiest although not that easy! We both thoroughly enjoyed all the rounds. They allow 2 hours per 9 holes which is basically a 4 ball pace so if you are a 2 ball there will be some waiting involved which is fine, just relax and enjoy the experience. We played in March and the weather was cloudy both days with Saturday being very cold and having to wear multiple clothing & knitted hats to keep warm. The course played ok but I thought the fairways were not at their best & the greens could have been better for such a course as Princes. I put it down to both being tined earlier on over the winter. For the average golfer the 3 course of 9 holes play hard with unforgiving deep pot bunkers - go in a few of theses and it will more than likely ruin your score, as it's difficult, sometimes, to get out of them. But overall there great to play, but not in cold windy conditions, better to play in warm conditions as the sea winds cut through you. I'd recommend a weekend break here, with overnight stay, for a group of golfers looking who enjoy golfing challenge with very good facilities attached. Great recommendation and very well organized by Barry Will be going back next year.